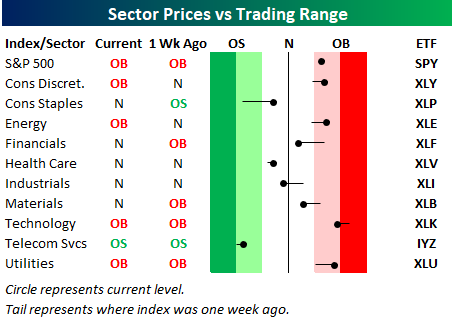 Below is one of the many charts included in this week’s Sector Snapshot, which is our trading range chart for S&P 500 sectors. The black vertical “N” line represents each sector’s 50-day moving average, and as shown, 6 of 10 sectors are currently above their 50-days. This week we’ve seen the Industrials sector break below its 50-day, and the Financial sector is getting close. At the same time, we’ve seen the Consumer Staples sector finally pick up a bit and move higher within its range. To see our full Sector Snapshot with additional commentary plus six pages of charts that include analysis of valuations, breadth, technicals, and relative strength, start a two-week free trial to our Bespoke Premium package now. Here’s a breakdown of the products you’ll receive.